“No single factor has been more crucial to reducing crime levels than the partnership between law enforcement agencies and the communities they serve,” said IACP President Richard Beary, as he announced that this year’s 2015 IACP and Cisco Community Policing Award will go to the non-profit All Stars Project for its Operation Conversation: Cops & Kids program. “I applaud those recognized with this prestigious award and know that what they have created in their communities will positively impact the law enforcement community worldwide,” Beary said. The prestigious award honors those police departments worldwide that have prevented and decreased crime and terrorism by forging positive partnerships with their communities. The award rewards best practices in community policing by recognizing police organizations that use the power of collaboration and partnerships to make local, national, and global communities safer from crime and terrorism. This year the NYPD earned the honor for cities worldwide with a population of more than 250,000. “Working with the All Stars Project has strengthened the relationship between NYPD and the youth of this city. 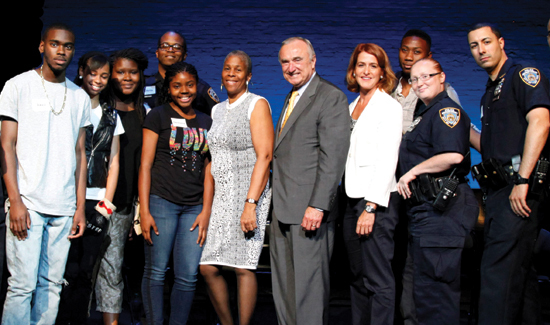 We look forward to continuing this partnership and deepening our connection to the communities we serve,” noted NYPD Commissioner William J. Bratton. Operation Conversation: Cops & Kids was conceived in 2006 by All Stars Project co-founder Lenora Fulani, Ph.D., a developmental psychologist and community activist interested in changing the culture of mistrust between young people from inner-city communities and the officers who police those communities. “Operation Conversation: Cops and Kids workshops give teens and cops the chance to step outside their usual roles and responses and discover new ways of relating,” explained Dr. Fulani. The program uses performance, theatre games, improvisation, and candid conversation to help teenagers and police officers in NYC’s low income neighborhoods build respect for each other and improve their relationship. One hundred and fourteen workshops have been conducted in the community involving 1,167 cops and 1,427 kids; 3,544 Police Academy graduates and 1,702 community members have attended workshops.